I wanted to do a quick analysis to examine the effect of Pluto and Mars in the birth charts of murderers. Mars and Pluto in astrology are associated with power, violence and anger. They obviously have other meanings but if one is going to examine the birth charts of murderers then these are the two planets that would stand out as culprits, as the case may be. In our data, we have 117 charts of murderers. I compared that to a control group of over 6600 charts of engineers, politicians, musicians, and actors. The likelihood that someone in this group would be a murderer would be small. The software used to conduct this study is the Fast Research module of Air Software set. It performs statistical analysis in order to determine if a criteria is valid under statistical conditions. Note: this is only a preliminary study and more work needs to be done to get a full analysis. For this quick analysis, I only examined sign placement, house placement, and aspects to the other planets using a 7° orb. With Pluto, I did not look at signs nor did I keep aspects to Uranus or Neptune as that would be a generational criteria. For instance Uranus sextile (60°) Pluto occurs only 3 times in a century. Pluto-Neptune aspects happen less frequently. 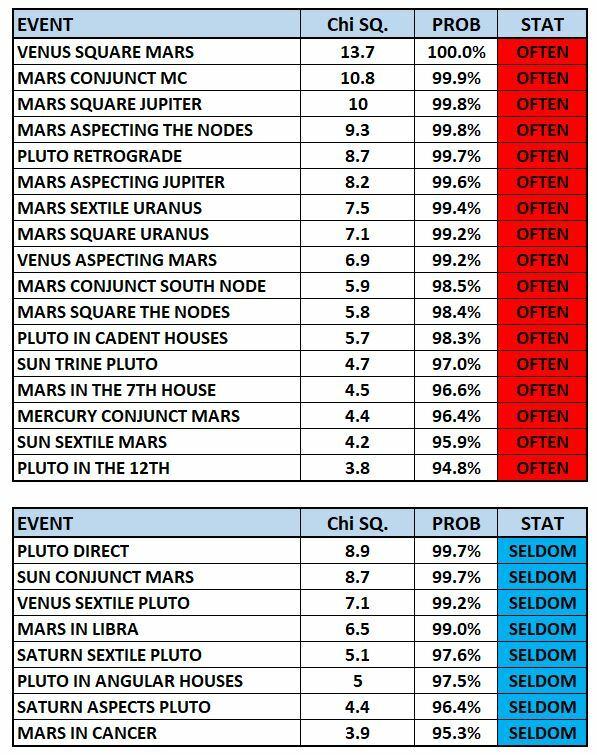 Mars squaring the nodes, Uranus, Jupiter and Venus rank high in our study. The square to Jupiter would suggest the murder would act and kill for his/her beliefs and with the square to Venus for desires or for love/relationships. The nodes suggests that they are somewhat destined to kill for some reason or another, meanwhile Mars aspecting Uranus leads to sudden action or they killed on a whim or they reacted suddenly. Note: I am using kill here because these are murderers. If the reader has some of these aspects he/she would act on things and not necessarily murder for them. Mars in the 7th house suggests they will fight against their “enemies”. Mars on the Midheaven suggest that they will be known for Mars like actions but also you can look at it as they are acting out their inner thoughts as Mars is opposite the IC or it is a struggle against or brought on by the family. Mars in fall in Cancer and in its detriment in Libra, doesn’t not rank high for murderers as it does not have the strength or capacity to function at its highest ability. With Pluto in the 12th of the unconscious, it suggests there are some hidden intentions or power dynamics that are working themselves out in the native’s chart. Planets in the twelfth house have trouble expressing themselves so they could lend themselves to outbursts and rash behaviour. Pluto retrograde scores high and suggests that there is an inward focus of the energy. Pluto trining the Sun probably gives them the sense of just cause to act the way they do. Pluto in cadent houses scores high. The cadent houses rule the mind, health, philosophy and the unconscious, which could all be trigger points of power and control which is associated with Pluto. Pluto in angular houses could suggest a better use of power or if they do misuse the power then it might make them controlling rather than murdering. This quick analysis shows that the concepts of astrology with respect to Mars and Pluto are being expressed in the chart of murderers as we would expect. Again, this is a quick analysis to examine an astrological criteria. Eventually, we the Astrological Investigators (http://www.astroinvestigators.com/) will be building an Artificial Intelligence model that will take all characteristics into account. If a person has many of the SELDOM events in his/her chart and only one or two of the OFTENs then that would mean they do not have murderous tendencies. Several of the OFTENs and little of the SELDOMS, then there might be a problem. There are other factors that will contribute to one’s behaviour such as upbringing.